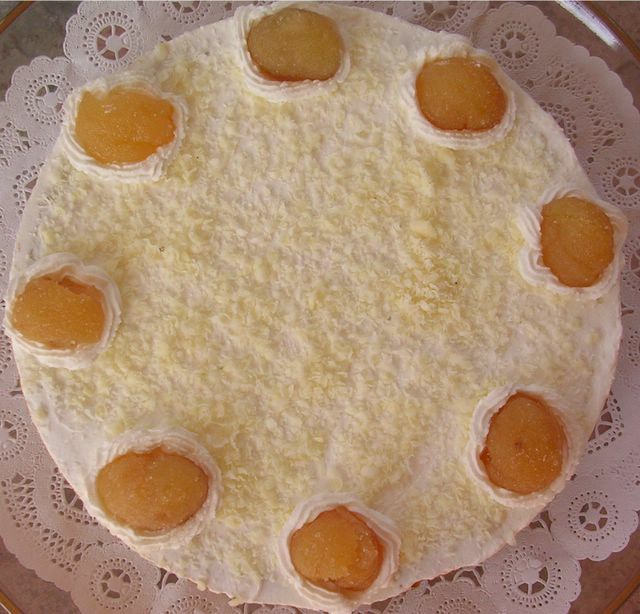 This is probably the most-liked dessert in my repertoire. It is from The Book of Cheesecakes by Steven Wheeler. (The Chocolate and Pecan Cheesecake I posted before also comes from this book.) I am not a big fan of cheesecakes, but ricotta cheesecakes are different because they are much lighter and they have an interesting texture. Add to that the joyful marriage of white chocolate and chestnuts in this recipe, and you have a sure winner! Chestnut puree can be found in most well-stocked supermarkets during the holiday season. It usually comes in cans imported from France, and can be quite expensive. For that reason, I used to bring my own yearly stock when I went to Turkey every summer. This has caused some minor disasters over the past years, and I decided that it is wiser to make my own puree and freeze it for future use. Sure, it takes some time and effort, but the results are well-worth it. I used my own homemade puree for this cheesecake, and it turned a dessert lighter in color and smoother in texture. Preheat oven to 350F. 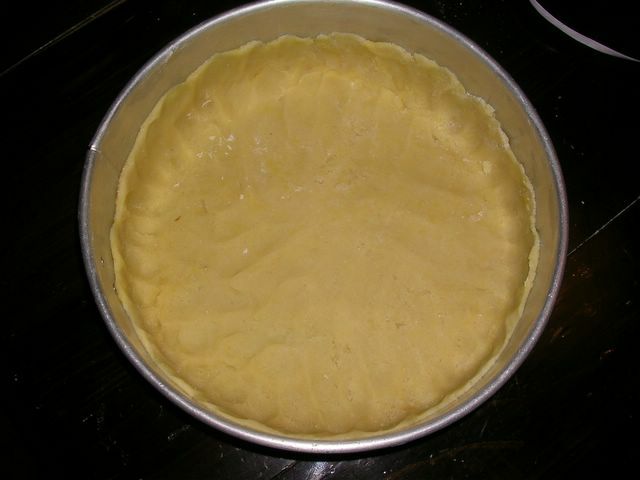 To prepare crust, melt butter in a small saucepan. Stir in the crushed wafers. Press mixture in a 8-inch springform pan (I used a 9-inch one). To prepare filling, beat ricotta cheese and chestnut puree in a medium-sized bowl. 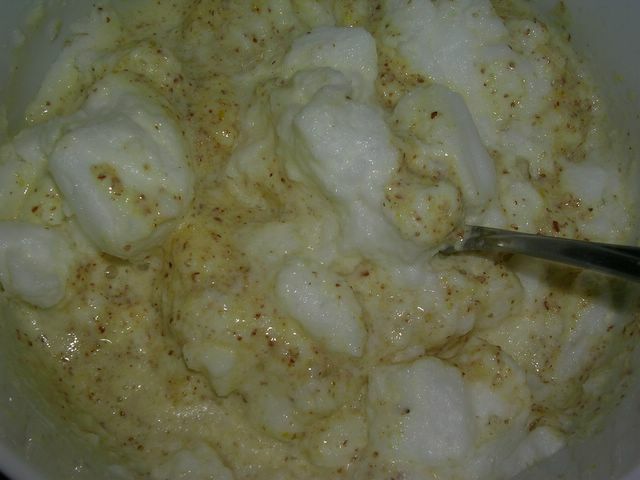 Bring whipping cream to a boil in a small saucepan; remove from heat. Stir in chocolate until melted. Stir in orange juice; blend into the cheese mixture. Beat in eggs and flour until smooth. Pour filling into prepared crust. Bake 1 hour or until set. (The center is still soft when I take it out.) Cool before you remove from the pan. Cover the top with whipped cream. (This is also a good way to cover cracks, if any.) 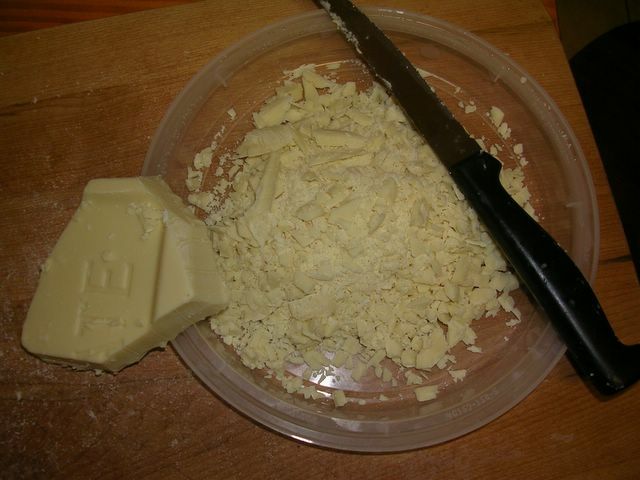 Sprinkle with grated white chocolate. Pipe 8-10 whipped cream rosettes around the edge of cheesecake. 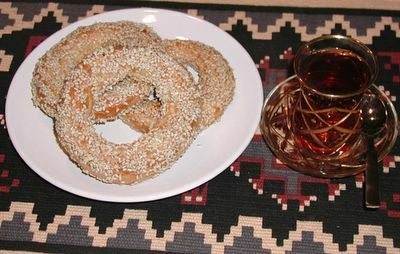 Place candied chestnut pieces in the rosettes. It is best served the next day. An Elegant Carrot Cake With A Luscious Cream Cheese Frosting. Melt the butter in a saucepan over medium heat. Cook until the solids seperate and brown to a dark golden color, 7 to 10 minutes. Remove it from the heat and let cool at room temperature about 30 minutes. Don't chill it.It needs to remain in liquid form. Set aside. Preheat the oven to 350F. Lightly grease and flour two 9inch round cake pans and line them with parchment paper. Sift together the flour, baking powder and baking soda into your mixer bowl. Add the ground almonds. Mix it lightly to combine. Combine the sugars and cinnamon in a bowl and stir to blend. In another bowl whisk the eggs lightly. Add the sugar mixture, the vanilla and the orange peel. Mix together quickly to combine well. Mix at a low speed while you are adding the dry ingredients. Once lightly incorporated increase the speed to whip for 2 minutes. Add the melted butter at a low speed and then increase the speed for 3 minutes. Gently fold in the carrots, pineapple and coconut. Pour the batter into prepared pans. Bake for 45 minutes or until a toothpick inserted in the center comes out clean. Let cool in the pans on a rack for 5 minutes. Cool completely before serving. 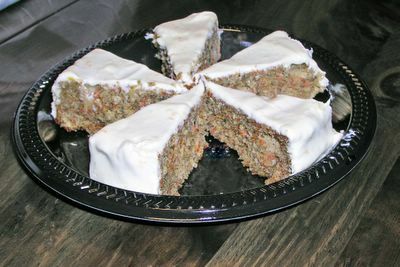 Wrapped airtight carrot cake will keep at room temperature for up to 2 days.When the cake is completely cool, top with the frosting and spread evenly to coat. The frosted cake can be stored for 1 day at room temperature. With a mixer cream the cream cheese and butter on a low speed for 4 minutes. When the mixture is smooth and lump free slowly add the powdered sugar. Beat for two minutes. Then add the orange zest, juice and vanilla. Mix to combine. The cream cheese frosting can be used right away or stored in the refrigerator for up to 3 days. 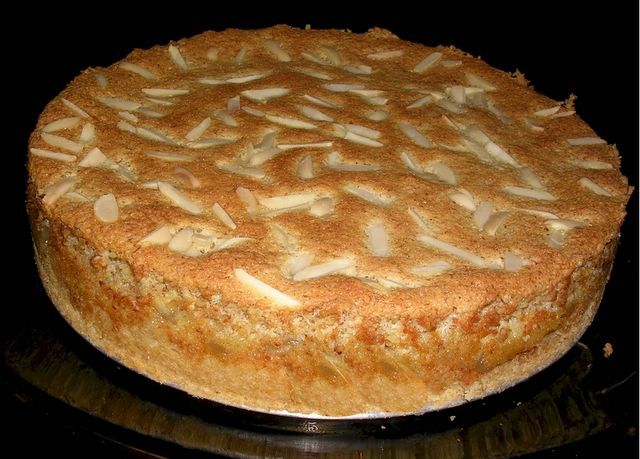 Here is another apple pie recipe that is a personal favorite. 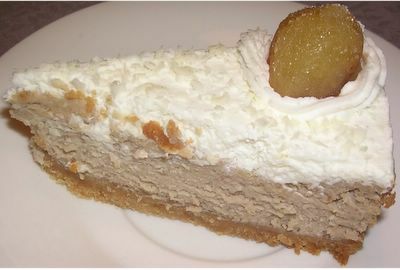 This one comes from Manhattan's Dessert Scene by Rose Reisman, where it is listed as a specialty of the famous Manhattan bakery Gindi. This apple pie might look like my previous post, but in fact, the two are quite different in both taste and texture. 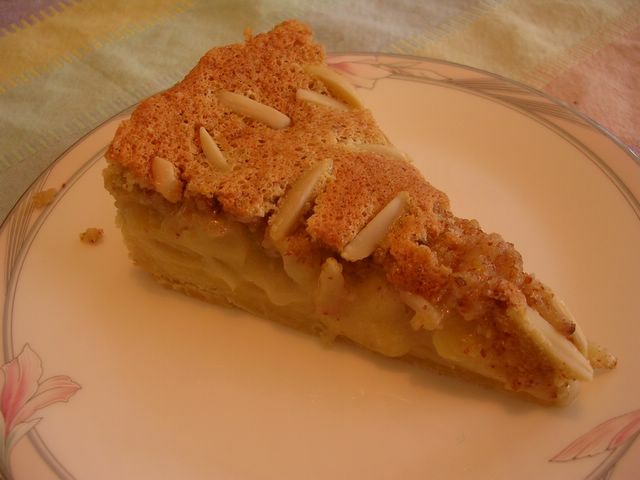 Swiss Apple pie has a lot of ground almonds in the moussy batter covering the sauteed apples, the flavor is definitely lemon and the texture is creamy. 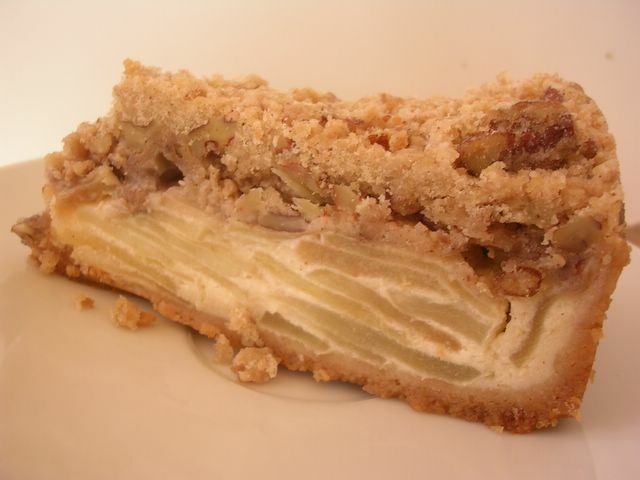 Sour Apple Pie, on the other hand, is almost all apples encased by a crunchy crust and a streusel topping. The common point is that they are both as far from the all-American apple pie as one can get. I changed a few things in the recipe, and I am going to write it as I made it. Preheat oven to 350F. Combine the crust ingredients well and press into a 9-inch springform pan. Mix all the filling ingredients except the apples in a large bowl until well combined. Add the sliced apples and mix well. Pour into the crust and bake 30 minutes. Meanwhile, prepare the topping. Place all the topping ingredients in the food processor bowl and process just until crumbly. (Of course, if your food processor is small like mine, you can do this the old-fashioned way. Mix sugar, flour, cinnamon and vanilla in a bowl, cut in the butter using a pastry blender until crumbly and add the chopped walnuts.) 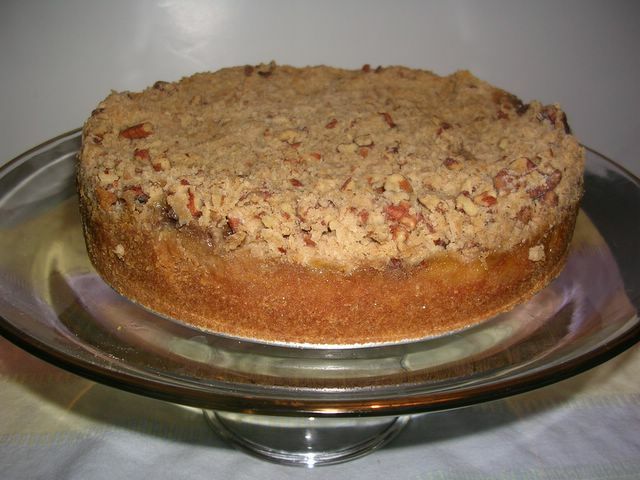 Sprinkle the topping on the partially baked filling and bake for another 15-20 minutes. Heat oven to 375F. Lightly spoon flour into measuring cup and level off. In medium bowl, combine 1 1/4 c flour, 1/3 c sugar, baking powder and salt. Mix well using a fork or pastry blender. Cut in butter until mixture is crumbly. Add 1 egg; stir until dough clings together. Using floured fingers, press crust mixture into bottom and up the sides of an ungreased 10 inch deep dish pie pan or 9-inch springform pan. Bake at 375 for 10 minutes or until the crust is set. 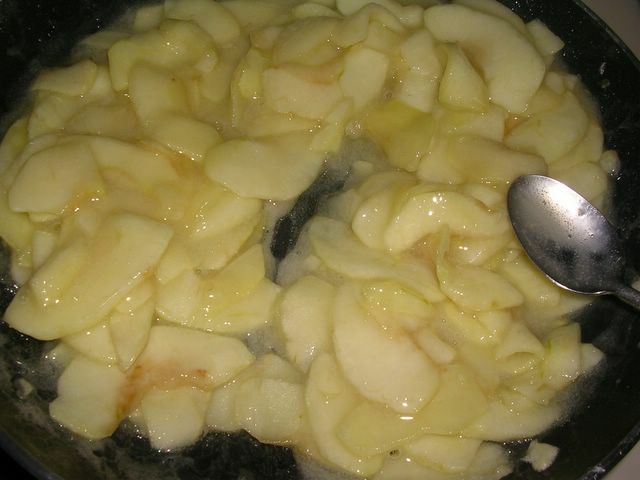 In a large saucepan or skillet, combine apples and lemon juice. Add 1 c of sugar and 2 tbs of flour; mix well. Cook over low heat 15 minutes or until apples are tender. Stir occasionally. Pour filling into crust lined pan. In a small bowl, beat egg whites until stiff peaks form; set aside. In medium bowl, combine egg yolks, 1/3 c sugar, lemon peel and 1/4 tsp salt; beat until it is thick. Blend in half and half and ground almonds. Fold in beaten egg whites and pour topping mixture evenly over the filling. Sprinkle the topping with slivered almonds. Bake for an additional 20-25 minutes or until the topping is deep golden brown. Serve warm or cool. Dissolve the yeast and sugar in the warm water and let stand in warm place for 10 minutes until frothy. Sift the flour and salt onto the work surface. Make a well in the center and put in the egg, sugar, butter, yeast mixture, and mahleb; mix with your fingertips. Gradually work in the dough. Knead on the work surface just until smooth (do not overwork dough), put in a buttered bowl, cover with plastic wrap, and let rest 30 minutes. Preheat the oven to 375 degrees. Divide the dough into 20 walnut-size pieces, roll each piece into a rope ¼ inch thick, and shape it into a ring, pressing the overlapping ends together. Then dip each ribg first in the egg, then in sesame seeds, making sure that they’re well coated with seeds on both sides. Bake on greased cookie sheet 15 minutes, until they’re golden brown. This is a Flickr badge showing public photos from zinnur doganata. Make your own badge here.